No one knows your Subaru like the factory trained technicians at Carr Subaru, just a few minutes outside Portland, OR. Though we specialize in Subaru maintenance and repair, customers from all over the Portland Area trust us to service vehicles from all major manufacturers. This is not only due to our reputation for honesty and quality work, but also because of our regularly updated service specials that ensure customers get the most from their investment. 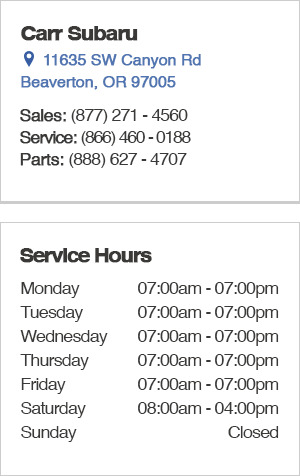 Our service center maintains extended hours and other convenient options for helping customers handle all of their Subaru maintenance and repair needs with ease. The Subaru factory trained technicians at Carr Subaru, serving Portland, Beaverton & Lake Oswego, know the importance of a safe and reliable vehicle and take pride knowing that the vehicles they have worked on will serve the customer well. Subaru brake service and repair can typically be done efficiently the same day. Stack the deck in your favor by scheduling an appointment either by phone at (866) 460-0188 or right here online. Now is a great time to schedule a checkup to ensure that your vehicle is in prime condition for all the Subaru adventure available throughout the Pacific Northwest. Subaru oil changes can typically be done quickly while you wait in our plush customer lounge. Even if you don't have a Subaru, trust the wide range of expertise in the Carr Subaru service department to handle all vehicle service and repair needs. Regardless of who made a vehicle, the difference between long reliable service and a money pit is quality maintenance and service. Our exceptional deals on a wide range of Subaru service and repair are among the many reasons that no one does Carr care like Carr Subaru. As a part of a family owned business, we have honed our customer service over more than 70 years assisting customers in every automotive need. Carr Subaru is proud to have the largest Subaru service and parts departments in the United States, so rest assured that there is nothing we can't handle. From minor service like Subaru tire rotation to major Subaru repair, you can count on us. Schedule an appointment today and continue down the road with the confidence that can only come with a well maintained vehicle. Here at Carr Subaru, serving Portland, Beaverton, Hillsboro, and West Linn, we're proud to offer so much more than just high-quality new Subaru vehicles and pre-owned vehicles: we're also home to a state-of-the-art service center! Our factory certified technicians are experts at providing the West Linn area with high-quality Subaru service, maintenance, and repair. Not only have these technicians had plenty of training and practice, but they use genuine Subaru parts, chemicals, and accessories on your vehicle--the same that you'll find in our well-stocked parts store. When you're ready to schedule service at Carr Subaru, your Portland Area service center, give us a call at (866) 460-0188; then, come by our convenient location at 11635 SW Canyon Rd, Beaverton, OR 97005. We can't wait to see you!